Benefit Auctioneer Tom DiNardo Prepares for March Madness. 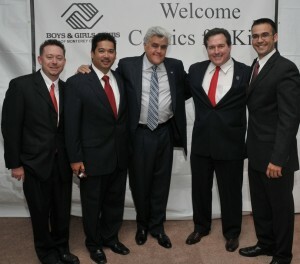 Benefit Auctioneer Tom DiNardo (Right of Jay Leno) prepares with his staff of benefit auctioneers for “March Madness” – 2012 Benefit Auction Season. Have you ever wondered what “March Madness” really means? The month of March is perhaps one of the busiest months during the year for nonprofits and charities in terms of their fundraising efforts. More benefit auctions are held during March than any month during the year. This trend truly appears to lack explanation except for perhaps United Way fundraising rules and blackout dates. What does the month of March mean for benefit auctioneers? This is a month of virtual insanity, sleep deprivation and excessive travel all for a good causes – the charities and nonprofits we work for. This month alone DiNardo & Lord Auctioneers – Charity Auctions had traveled to multiple states and crossed the continent more than a few times. Mount Vernon, WA; Denver, CO; Sarasota, FL; and Palm Springs, CA were just a few of the cities we visited. If your nonprofit or charity is seeking one of “The nation’s top 4 ranked charity auction firms”, then give us a call. We help you to create record setting benefit auctions.